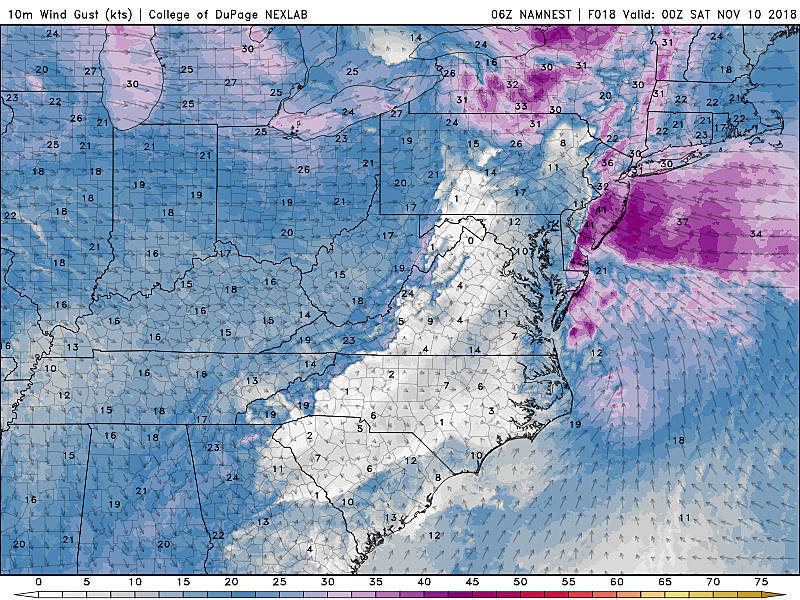 Yet another fairly significant storm system is eyeing New Jersey, and will bring a transition to wet, windy weather on Friday. That will set us up for a sunny, dry, windy, and cold start to the weekend. Skies are becoming mostly cloudy across New Jersey as of Friday morning. Temperatures are starting out generally in the 30s (some 20s in the cool spots and 40s along the coastal plain). We'll top out in the lower to mid 50s Friday afternoon, with a bit of a breeze to 20 mph. --5 a.m. to 10 a.m.: A few showers and sprinkles will creep into southern and western New Jersey. --10 a.m. to 3 p.m.: Scattered showers become a bit more widespread. --3 p.m.: Prime time begins. Steadier rain starts arriving. --6 p.m. to 10 p.m.: A period of heavy rain and gusty winds (to 40 mph) is likely. --Midnight to 8 a.m.: Drying out overnight. Still a chance for a lingering sunrise shower right along the coast. It's going to get pretty nasty Friday evening as that soaking rain and fierce wind blows through. With 1+ inch of rain a good bet for most of the state, pockets of flooding are possible. (That's especially concerning given the timing of heaviest rain coincides with the evening commute.) Forecast models suggest the biggest rainfall totals will occur across the northern half of the state. A Flash Flood Watch has been issued from 6 p.m. Friday to 5 a.m. Saturday for northeastern New Jersey: Bergen, Essex, Hudson, Passaic, and Union counties. A Flood Watch has been issued for the same timeframe for the rest of the area north of Interstate 195: Hunterdon, Mercer, Monmouth, Morris, Somerset, Sussex, and Warren counties. Saturday's sky will become mostly sunny by late morning, and the bulk of the day will be dry. However, it will be blustery — that's the uncomfortable combination of windy and cold. Wind gusts could exceed 30 mph for much of the day, as cooler air arrives from the west-northwest. As a result, temperatures will go nowhere as the day presses on. Thermometers will be near 40 degrees Saturday morning and only around 45 degrees (at best) by Saturday afternoon. 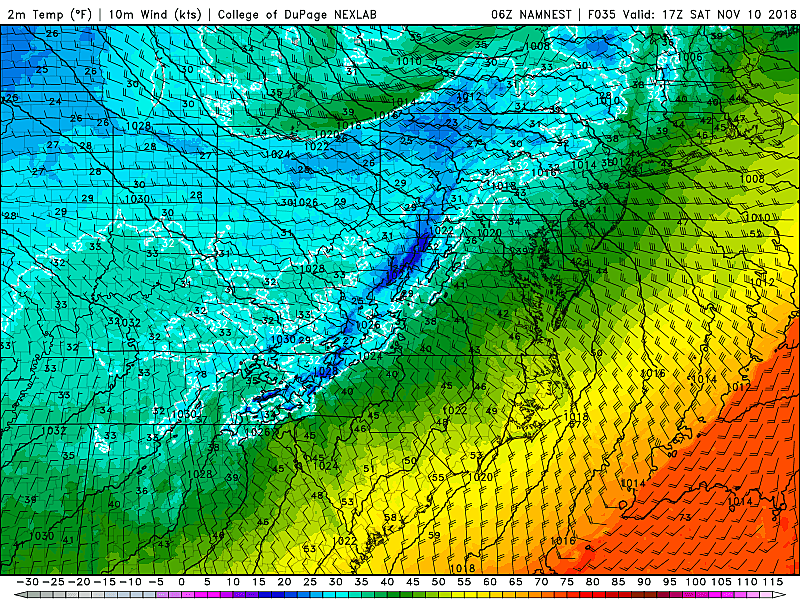 The NAM model continues to paint 30s all day — I have to admit that's a real possibility, and really cold! On Sunday, we'll lose the wind and keep the dry sunshine. However, it will remain quite chilly. A widespread, nearly statewide freeze is possible in the morning with lows ranging from the mid 20s to lower 30s (away from the coast). High temps on Sunday will again only reach the lower to mid 40s. Just to give you some perspective, that forecast would be normal in mid December or late February. In early November, it's almost 15 degrees below seasonal normals. You'll need to keep the jackets, hats, and gloves handy for much of next week, as the chilly weather pattern will continue. We'll be lucky to hit 50 degrees on Monday, with increasing clouds. Tuesday gets stormy again. A period of rain is likely, along with a stiff breeze and another batch of tumbling temperatures. This storm system could get interesting as it departs. As temperatures approach and fall below the freezing mark Tuesday evening, there will be a chance for some snow showers on the very backside of the system. I'll even go so far as to say that a coating of accumulation is possible if conditions are perfect — the timing of the temperature drop and precipitation end has to be just right, the ground has to be cold enough, the atmosphere has to retain enough moisture, the snow has to fall hard enough, etc. Again, travel concerns are minimal. And the rain-wind-cold pattern repeats again. After a wet Tuesday, Wednesday looks sunny, blustery, and cold. Thursday looks sunny and cold too.